Thinking of getting away? You probably have much less vacation than workers in other parts of the world. (CNN) -- Let's be blunt: If you like to take lots of vacation, the United States is not the place to work. Besides a handful of national holidays, the typical American worker bee gets two or three precious weeks off out of a whole year to relax and see the world -- much less than what people in many other countries receive. And even that amount of vacation often comes with strings attached. Some U.S. companies don't like employees taking off more than one week at a time. Others expect them to be on call or check their e-mail even when they're lounging on the beach or taking a hike in the mountains. "I really would like to take a real, decent vacation and travel somewhere, but it's almost impossible to take a long vacation and to be out of contact," said Don Brock, a software engineer who lives in suburban Washington. "I dream of taking a cruise or a trip to Europe, but I can't imagine getting away for so long." The running joke at Brock's company is that a vacation just means you work from somewhere else. So he takes one or two days off at a time and loses some vacation each year. Only 57% of U.S. workers use up all of the days they're entitled to, compared with 89% of workers in France, a recent Reuters/Ipsos poll found. Brock's last long holiday was more than 10 years ago, when he took a two-week drive across the country. It's a totally different story in other parts of the world. Nancy Schimkat, an American who lives in Weinheim, Germany, said her German husband, an engineer, gets six weeks of paid vacation a year, plus national holidays -- the norm. His company makes sure he takes all of it. It's typical for Germans to take off three consecutive weeks in August when "most of the country kind of closes down," Schimkat said. That's the time for big trips, perhaps to other parts of Europe, or to Australia or North America. Germans might also book a ski holiday in the winter and take a week off during Easter. Schimkat's family back in the United States teases her that she's spoiled. But when she tells Germans that workers in the U.S. usually get two weeks of vacation a year, they cringe. "They kind of have this idea that Americans work like robots and if that's the way they want to be, that's up to them. But they don't want to be like that," Schimkat said. "[Germans] work very hard, but then they take their holiday and really relax. ... It's more than just making money for Germans, it's about having time for your family and it's about having time to wind down." 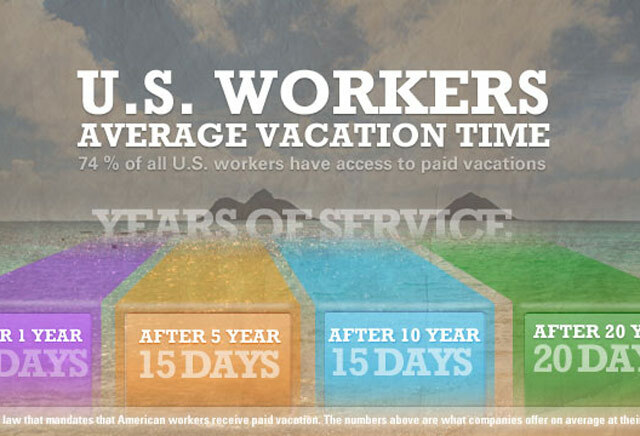 A big reason for the difference is that paid time off is mandated by law in many parts of the world. Germany is among more than two dozen industrialized countries -- from Australia to Slovenia to Japan -- that require employers to offer four weeks or more of paid vacation to their workers, according to a 2009 study by the human resources consulting company Mercer. Finland, Brazil and France are the champs, guaranteeing six weeks of time off. But employers in the United States are not obligated under federal law to offer any paid vacation, so about a quarter of all American workers don't have access to it, government figures show. That makes the U.S. the only advanced nation in the world that doesn't guarantee its workers annual leave, according to a report titled "No-Vacation Nation" by the Center for Economic and Policy Research, a liberal policy group. 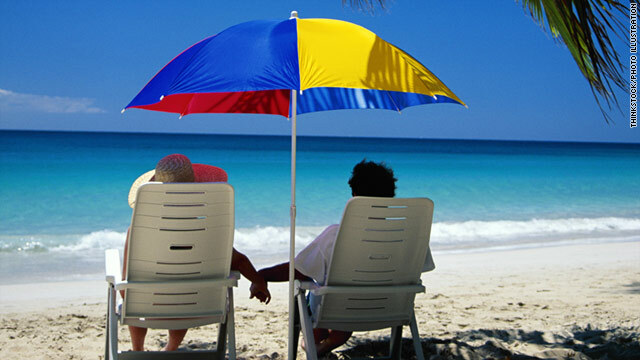 Most U.S. companies, of course, do provide vacation as a way to attract and retain workers. But the fear of layoffs and the ever-faster pace of work mean many Americans are reluctant to be absent from the office -- anxious that they might look like they're not committed to their job. Or they worry they won't be able to cope with the backlog of work waiting for them after a vacation. Then, there's the way we work. Working more makes Americans happier than Europeans, according to a study published recently in the Journal of Happiness Studies. That may be because Americans believe more than Europeans do that hard work is associated with success, wrote Adam Okulicz-Kozaryn, the study's author and an assistant professor at the University of Texas at Dallas. "Americans maximize their... [happiness] by working, and Europeans maximize their [happiness] through leisure," he found. Critics say it's time for a change. "There is simply no evidence that working people to death gives you a competitive advantage," said John de Graaf, the national coordinator for Take Back Your Time, a group that researches the effects of overwork. He noted that the United States came in fourth in the World Economic Forum's 2010-2011 rankings of the most competitive economies, but Sweden -- a country that by law offers workers five weeks of paid vacation -- came in second. De Graaf drafted the first version of the Paid Vacation Act of 2009, which would have required larger companies to provide at least one week of paid annual leave to employees. But the bill, introduced by then-Rep. Alan Grayson, D-Florida, in May of 2009, got little traction. Opponents said that it would have a negative impact on business and that the government shouldn't get involved in the workplace in this way. "You would have had the idea that we were calling for the end of Western civilization. Comments like, 'Oh, they're going to make America a 21st-century France,' as if we were all going to have to eat snails," de Graaf said. "I'm in no way anti-capitalist, I think the market does a lot of good things, but the Europeans understand that the market also has its failings and that when simply left completely to its own devices, it doesn't produce these perfect results." But is more government regulation the answer? The debate rages on. Back in suburban Washington, Brock -- the software engineer who hasn't had a long vacation for more than 10 years -- is finally planning a real getaway. His 60th birthday is coming up in December, and he'd like to do something special, maybe go on a cruise to the Bahamas. Will he be able to pull it off and get away from work? He's still not entirely sure, he said.